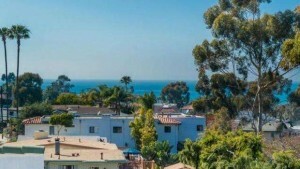 217 El Portal #A, San Clemente Ca. This brand-new Spanish Revival home in San Clemente has it all. High-class amenities, gorgeous ocean views and plenty of space makes this home a must-see. You can get in the game for the gorgeous home with a price of $925,000. It comes with three bedrooms, 3.5 baths and 1,880 square-feet of living space. Let’s take a closer look at the features of this Santa Catalina home for sale. This home for sale in San Clemente comes with an upside down floor plan. On the main level, there are two bedrooms, one full bath, a laundry room, tech area, storage closet and direct garage access. The kitchen is on the second level. It features top-of-the-line faucets, stainless appliances, large granite island and high-end maple cabinetry. There is luxurious wood-like floors throughout the home, as well as other dramatic features like a wrought-iron staircase, 9′ ceilings, solid core doors and security system. Outside of the home is equally as impressive. Amenities include a stainless barbecue, fireplace and mahogany doors. There is also a two-car garage with plenty of storage. San Clemente is an amazing place to live in Orange County and this newly-built home will put you in the perfect situation. In addition to all its attractions, it’s also conveniently located near shopping restaurants and the beach.